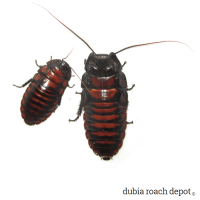 Our complete selection of roaches other than B. dubia. These include giant hissing cockroaches from Madagascar. 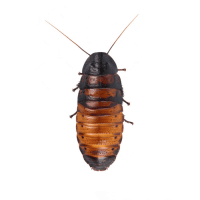 Large roaches make excellent feeders for animals that need a big insect. They also make fun and interesting pets because, let’s face it, giant tropical hissing cockroaches that climb up glass are super cool! We think so, anyway. They’ve been known to prompt interesting party conversation. All of the roaches here can be used as feeders or breeders. All sizes and sexes are available, stock permitting. Fast shipping, everything arrived alive and lively. The beetles started cleaning house almost immediately. Also the many different pay options are nice, especially when your like me and forget your wallet in the truck and you can just sign into amazon.